Buttery creamy goodness. I could not have been happier with these melting potatoes. So good, so easy, and boy, did I ever eat more than my share. Good thing it was just Anita and me, because I would’ve had to explain where all the potatoes went if we would’ve had company over for dinner. If you’re normally tempted to put ketchup on your potatoes, don’t. These potatoes are absolutely perfect just as they are. Yukon potatoes are the best potatoes by far for making melting potatoes. They are so tender and velveety. They get just a little golden brown crunchy edge to them. Just enough to contrast the tender insides. Also try my roasted spiral potatoes. They’re pretty and pretty darned good! Add the butter, thyme, salt and pepper and toss to coat. Transfer to a rimmed baking sheet lined with a silicon baking mat or aluminum foil. Bake for 15 minutes. Flip the potatoes and cook another 15 minutes. Add the chicken broth and garlic and stir. Cook another 15 minutes or until golden brown. Remove and serve sprinkled with Parmesan cheese. I’ve been using seasonings from Dizzy Pig for years. Everything they make is packed with flavor and is of the highest quality. Dizzy Pig has a wide variety of spice mixes available, like this Raging River seasoning that is absolutely perfect on a chicken roasted in the Char-Broil Big Easy. I made a beer-can version, but you can skip that step and just season the chicken and cook it as-is in the Big Easy. Either way, you get a great maple-infused herby flavor with just a slight spicy kick that is out-of-this-world great. 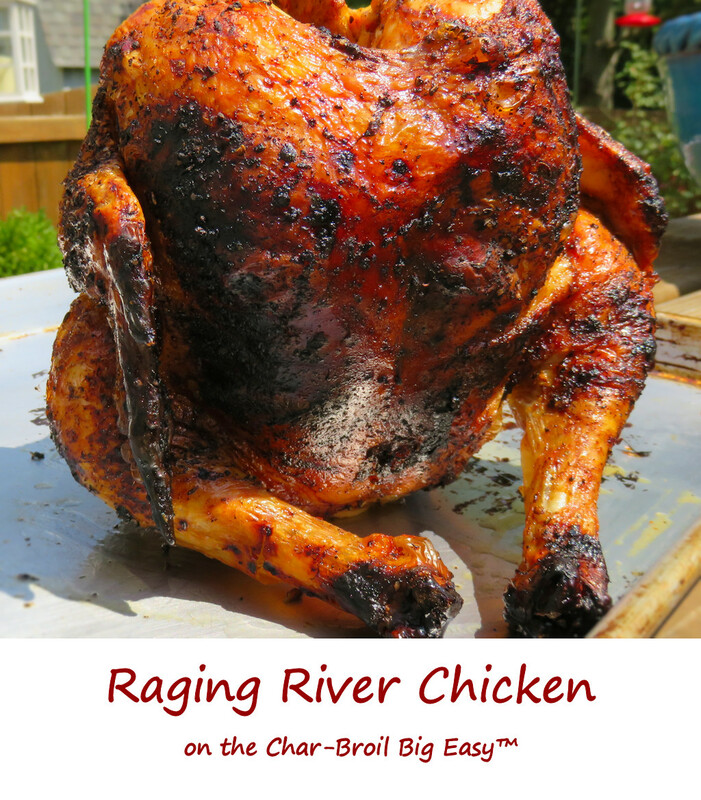 Raging River chicken tastes (and looks!) fantastic! The skin is crispy and, well, addicting. Very addicting. Dangerously addicting. So is my rotisserie-style chicken, also made on the Big Easy, which you should also try. It’s amazing how great poultry on the Big Easy is, with just a few store-bought ingredients. I use the Char-Broil folding chicken roaster to hold the beer or soda cans securely. If the beer you're using is only available in a bottle, just empty the contents into an empty beer or soda can. Lightly brush the chicken with olive oil. Generously sprinkle the chicken with the seasoning. If opting to make beer can chicken open the can and drain (er... drink) about 1/4th of the beer. Add a heaping teaspoon of seasoning to the beer. Insert beer can into the bottom of the chicken. Place chicken into the basket and insert into the Big Easy. Cook for 15 minutes per pound or until the chicken has hit 165 F as measured in several locations. Let rest 15 minutes before removing the beer can (if using) and carving.